This morning I selected the reddish canvas that I painted last week. 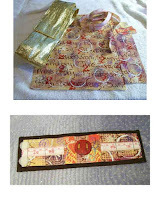 I selected a white measuring tape a button thingie (from a belt), a couple little scrap pieces for the 2nd cuff, and a wonderful gold lamay scarf that I also got last Yard Sale Saturday. I put together the top and cut the scarf. I quickly decided that the gold lamay was not such a great idea; just a bit scratchy and I'm not sure how well it will hold up to frequent wearing ... the good ole sweat factor (something we southern ladies have to consider). I want these pieces to be washable (at least handwash in a sink) when/should they get dirty. So, out went the gold, and in came the brown from a scrap piece ... nice appearance, sturdy & washable. Finished it off with round piece of tan velcro .. stitched into place.